Hello all! Sorry for taking such a long time to post about this beauty class, since I was away in my hometown for Ied Mubarak holiday. 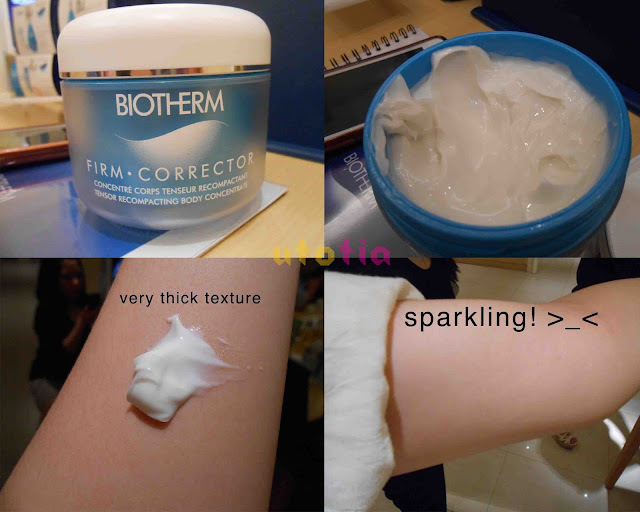 This beauty class was held last month in collaboration of Biotherm and Carnellin. For those of you who wonder who is Carnellin, she is one of beauty bloggers in Indonesia, one of some beauty bloggers that I love anyway. She often share about product reviews from various beauty brands and lately started to upload more vlogs. Visit her beauty blog here. So, I was lucky to win the invitation from her since I also posted about the event previously here. So actually, the above picture is Biotherm's latest product line; Blue Therapy. It helps with aging problems like wrinkles, dark spots, and improve firmness. The beauty class was held in Beauty Lounge in Sogo Central Park. The audience were readers and bloggers. 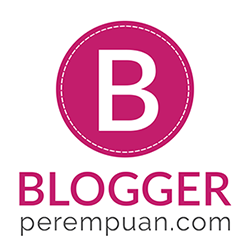 I was really happy to meet other fellow bloggers like Ci Mei, Ci Hanny, and Jesslyn. The highlight of the day was Biotherm's latest product line; Blue Therapy. I didn't try it on since it is addressed to aging women. Hehe. And this is the best selling product range from Biotherm; Aquasource. I remembered when I tried this on 1-2 years ago, the texture is really lightweight, doesn't feel sticky at all, it reminded me of water and gel. And since there were few men who actually attended this beauty class, of course Biotherm has its own men range as follows. And I'm quite surprised with variety of product lines they have for men. They have anti-aging, oily skin solution, whitening range, even BB Cream! I have to admit that I fall in love with Biotherm's packaging. And not to forget that I tried that men BB cream on and it's really good indeed! Unlike any other men's product, it has no "men" scent which kinda annoying for me (and some other women). Nice, almost neutral scent, with decent coverage for daily usage. I also tried these two perfume. The blue one matched with the latest range from Biotherm, which inspired by the sea. And the lime-to-yellow one was said to be Carnellin's favorite since it has vitamin E infused! Yes, so you got double benefits with this eau de toilette. The smell's really nice too. And surprisingly enough, Biotherm has Make Up Base, BB Cream, and..... the latest obsession of me and (I bet) the rest of women in the world, CC Cream!!! Yay, now I'm seriously excited. Moreover, Biotherm has 5 kinds of CC Cream while other brands usually only have one-shade-fits-all product! I mentioned 5 because they actually sell 5 kinds of CC Cream. 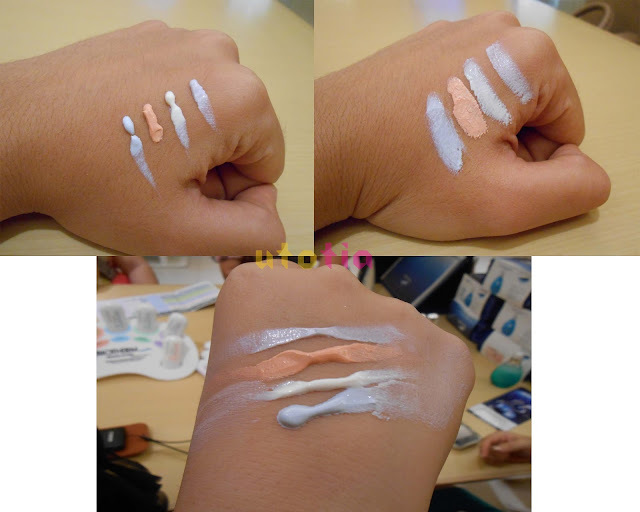 But, due to the our Indonesian FDA matters, so far they can only provide us with 4 different shades. It's purple (evenness), white (bright), orange (glow), and blue (luminous). The other one is green, the manager said. So the class is fun, it's not that formal with all the talks and no experience of trying. And I would also share to you another product that I love after trying it out at that time. After being told by Carnellin that this product actually can help to improve skin firmness instantly, I was tempted to try. So I poke a small amount of the cream and put it on my flabby arms. The texture is really thick and yes, it instantly change your flabby arms! Though it wasn't significant but yes, I can notice the change. And it has sparkly effect too, LOL. I also got the facial treatment and the BA chose this range for me since I experienced some acne and have oily T-zone. And here are the audience that day.